I' ve started a test knitting - maybe it's not - of the Valentina Cosciani' s Capuccino. I have this lovely handspun yarn Zabbers sent me. It's a hand painted Blue faced Leicester fleece named Camouflage from High bid farm, Brockport NY. The main colour is more bright green and I really love the way the sand cables used by Tibisay for her pattern does work with a handspun yarn. I'm a knitter from California spending a week in Venice, and I'm thinking about taking the train to Trieste for a day or two. I saw your post about stitch'n'spritz -- I love this idea! Are they still doing it? What day do they meet? Are there good yarn shops in Trieste? 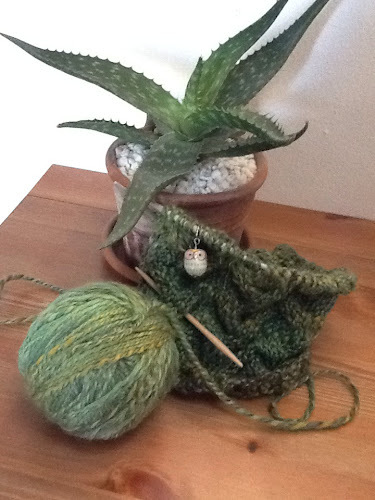 I'd love to meet up with you if I come -- it would be great to meet a knitter.